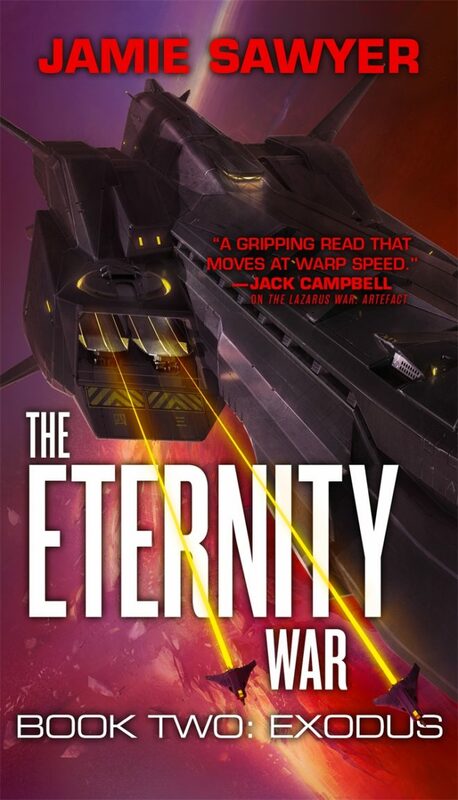 The Eternity War: Exodus is the adrenaline-fuelled second novel in the Eternity War – a new SF trilogy from Jamie Sawyer, set in the same universe as his acclaimed Lazarus War novels. For a long, hurt moment Clade Cooper – former Alliance Army Ranger, more recently turned head of the Black Spiral terrorist organisation – was back there. Cooper spluttered, cried out. Gasped for breath like a drowning man. The burn in his chest felt so real that he put a hand there, and held it. Clutched at his own beating heart. It’s a dream. Just a dream. Nothing more. Finally, when Cooper knew he could accept it, he sighed to the dark. Let his breathing fall into a rhythm, and was glad when the hot, dry air filled his lungs. That was the good hurt. But the nightmare lingered, a guest outstaying its welcome, and that was the bad hurt. The horror had been warm, and very wet, pervading every element of his body. One leg out of the bunk. Foot to the cold floor. Pain crept through the limb and it took all of his strength not to scream, but the sensation was passing. Cooper rolled his body around, allowing the bedsheets to grate against his skin – causing another ripple of discomfort through the mass of scar tissue that was his flesh – and sat up. The room around him was dark, and empty, but that didn’t mean that he was alone. The place was filled with ghosts. They gnawed at the edge of Cooper’s consciousness. Threatening to drag him down into the Deep. There was a communicator beside Cooper’s bunk, and it chimed once, an indicator light warning of an incoming communication. Such a simple, innocuous thing – part of everyday life aboard a starship – but it evinced a sudden reaction in Cooper. He snapped his neck around to respond. Desperately trying to stop himself from falling back into the nightmare. Into the wet. Into the shadow . . .
A face appeared on the communicator’s small screen, throwing a thin light over the chamber. As much as Cooper hated to admit it to himself, he was grateful for the illumination, and glad to see the face there. It was one of his Disciples; a small, greying man, with a middle-aged face. The Disciple’s nation and planet of origin were unknown, but he had once been a doctor. That didn’t matter any more, because now he had no title. It was the Black Spiral’s way: none of the Disciples had any proper rank. It was, Cooper supposed, a consequence of his response – his rebellion – against the structures that had once bound him. He had known many doctors, once, but he was no longer that man. Cooper could remember her eyes, most of all. They were almost pleading, because no one could live in that much pain. Not if they wanted to remain human. “I am fine,” Cooper growled. Cooper reached over and activated the pain-relief system set into the bunk control console. The effect was instant: the cool spread of analgesics spreading through his dry, tortured body. He felt as though he was inflating inside his own skin, becoming more alive with each heartbeat. The nightmare’s shadow quickly receded, leaving nothing more than a psychic stain. He felt a brief stab of resentment – of displeasure that he had to rely on the machines around him to live, to endure any sort of quality of life – but it was passing. Whenever Cooper slept, he did so attached to the apparatus. The machinery constantly flushed his blood of the poisons that accrued there, and was a requirement of being outside his armour. The filtering device was a fact of life, nothing more. “Lieutenant Runweizer has reported.” Runweizer was one of many agents deployed on Old Earth, within the structure itself. Like many military converts, Runweizer was less willing to give up his title than other Disciples. However, such operatives were a necessary evil. “He has visited the target’s last known location,” the Disciple said, but left it at that, hesitant to give the full report. Pain relief and medical supplies, as well as other essentials for shipboard existence, were growing sparse. Another fact of life aboard the starship, and one that Cooper felt acutely. The Disciple looked on with doleful eyes. Perhaps it was the doctor in him; still seeking to understand what was happening to Cooper. That made a smile jerk at the corner of Cooper’s mouth, because he didn’t really understand this himself. He doubted that anyone understood what was happening to him. The Disciple went to open his mouth, to speak some more, but Cooper cut the comm. The after-image of his grey, aged face lingered on in the dark for a second or so, then Cooper was alone again. What had she meant to say? It had been many years since their meeting, and Cooper had often caught himself wondering what she had sought to tell him. Had she wanted him to die? To give up? Never. While I live, their memory continues. They live. Cooper’s eyes fell to his armoured suit. It sat in the corner of the room, illuminated in its charging cradle. He couldn’t remember having activated it, but that wasn’t new. Increasingly, he had found the armour switching on without his permission: the wrist-comp flashing as it connected with unseen networks, the weapons systems cycling up of their own accord. It was as though the armour itself was becoming sentient, reaching out to other machines around it. Cooper stood on pained legs and wandered to the suit. Its black plating was scratched, battered. The manpower-amplifier was an older pattern, the attenuators and strength-augmentation system partially exposed on the arms and legs. Still, every threat-marking and kill-score had been painstakingly restored: the skull-motif glared back at him from the helmet. He reached out, caressed the armour. Felt a prickle of static touch his skin, and more exquisite agony erupt inside of him. The old gods were coming back, and they were hungry.